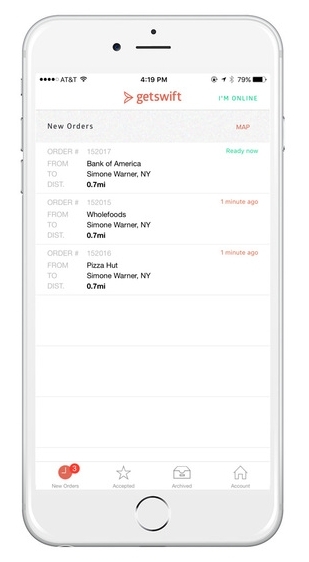 GetSwift enables you to send automated alerts with an order summary, proof of delivery and feedback form, allowing your customers to confirm order details and give you feedback. We also give you the ability to customize your SMS alert messages and upload your company logo so your customer has the full white labelled experience with your brand. Manage performance via real-time and historical data. Compare performance in multiple divisions of your operation. Everything you need to know about your business can be found in the reporting pages on your account. "Thanks for your message. We do not monitor this inbox and so if you could kindly email us at info@yourcompany.com we will take care of you!" As part of the above pricing you get access to everything as well as allowed to invite/add unlimited users, dispatchers and drivers to your account. Do you want to connect your website to GetSwift? Do you want to trigger an invoice from your accounting software once a new delivery has been completed in GetSwift? Do you want an easy way to send your new tasks from your platform to GetSwift? Now you can track every parcel in real-time. Reduce your missed delivery count. Reduce customer complaints. From pick up to drop off, you and your customer will know your driver's every move. Monitor your driver's service and performance. Monitor customer feedback in real-time. Turn a bad experience around before it leaks on social media and google. Convert and up sell every customer to return and buy again and again from your website directly from this page! This is a list view management dashboard to notify drivers, re-assign deliveries, or even check on a delivery status. This page operates the same as your map dashboard and is very effective if you prefer to use a ticket based system to get tasks out the door. You can also use the GetSwift webhooks to send information and events back to your platform like "delivery completed" webhook to trigger invoice or email to be sent from your platform. You might deliver for the same regular customers each week and you just need a simple way for them to book new delivery requests with your business. Well now you can invite them to use your public booking form for them to easily log in and place delivery requests with your company. Once your client fills out the form and submits the booking the new task will then instantly appear in your GetSwift map to dispatch and manage. Digitally capture a photo, scan a parcel barcode, delivery notes, complete a delivery form checklist or have the customer sign on your driver app to prove delivery. Every driver in your fleet will be able to log into an IOS or Android courier app for them to use and manage their tasks. 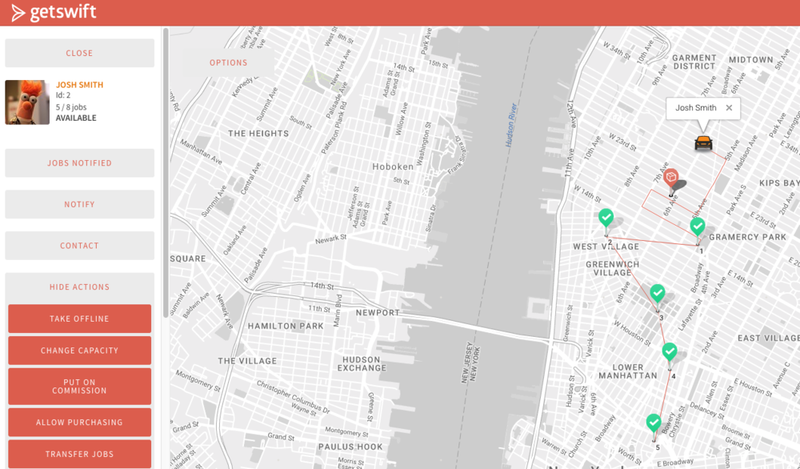 Your customers will have a live map to track their deliveries and view the real-time ETA of the driver. GetSwift automatically predicts the Estimated Time of Arrival (ETA) of your drivers out in the field. DELIVERY STATUS: How many minutes until driver completes next stage of delivery? DELIVERY RUN COMPLETION: When will driver complete their current run of deliveries? Provide a superior delivery experience over your competitors. By offering live tracking and real-time status alert updates you will instantly build deeper trust and satisfaction with your customers. They will return to purchase more and purchase more often! By adding tracking and real-time alerts we have seen GetSwift businesses increase their customer retention by 31% and increase their order sizes by 12%! The GetSwift proprietary routing algorithm can automatically optimize your driver daily routes to save your business time, fuel and vehicle costs, and all whilst maximizing the daily drop count per driver per day! The GetSwift proprietary batching algorithm can automatically assign a driver based on: Distance, Smart Batch, Availability, Current Load Capacity, Direction, Best Performing Driver and more! We have a number of other proprietary dispatching options for specific use cases like: food delivery, liquor distribution, unique skillset allocation and more!